Anne Barnhill, David Chorlton, Janyce Stefan-Cole, S. Craig Renfroe, Jr., Heather Jane Collings, Richard Allen Taylor. Wake, Wake Wake by Valerie Nieman, The Last of Her Kind by Sigrid Nunez, Why Monkeys Live in Trees by Raouf Mama and Andy Jones, Terrestrial Music by John Bradley, Up North by Harry Smith and Eric Greinke, Behind Every Door by Terry Godbey, The Apparitioners by George Witte. Buffy Aakaash, Patrick Carrington, Peggy Smith Duke, Catherine Carter, Noel Conneely, Barbara Conrad, Barbara Cranford, Nancy Compton Williams, Jim Daniels, Phebe Davidson, Steve De France, Dory L. Hudspeth, Gary Every, Hugh Fox, Zan Gay, Bill Griffin, Dolores Guglielmo, Jerry Judge, David Lawrence, Mary Soon Lee, Barb Lundy, Ken Meisel, Jerry Mirskin, Ellaraine Lockie, Susanne Morning, Tim Poland, David E. Poston, Tom Rich, Rosemary Royston, Dan Schneider, William Sheldon, Jim Spurr, Robert Tremmel, Michael Rattee, Julene T. Weaver, Eric A. Weil, John Wheatcroft, Linda Newman Woito. 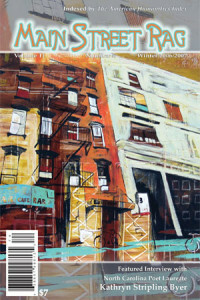 Cover Art: Acapulco Bar, NYC by Sharon Dowell. Images by Charlotte Reeves Bowman, Doug South.